If by dawn still linger on your skin mixed scents of leaves, frost and violet blooms, and that relentless yearning for stellar sights, you will know that, at night, you felt the milky breath of a unicorn. Short of an avalanche of fascinating launches from niche perfumeries between now and the end of the year — how likely is that? — LesNEZ, along with Le Labo, will easily make my list of the best fragrance news of 2006. 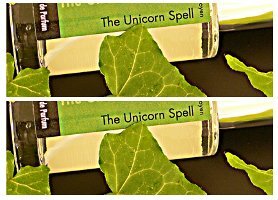 All three of their fragrances are interesting and beautifully done; of the three, The Unicorn Spell seems to be the early favorite on the blogs and fragrance boards, and it is easy to see why. The Unicorn Spell starts off with, as advertised, frosty violet: it is cold, mildly green, and has a rooty-earthy, iris-like undertone. The coolness lasts well into the heart, which is rather like smelling the more conventionally pretty Annick Goutal La Violette through a faint haze of Serge Lutens Iris Silver Mist; it has a kind of vaporish quality that nicely fits in with the ad copy. The dry down adds pale woods and a bit of something like tea; I would not have noticed it myself but Victoria of Bois de Jasmin quite rightly pointed out to me that there is a definite affinity with Annick Goutal Duel in the later stages (see her review of The Unicorn Spell here). It is a very appealing fragrance, and combines the best qualities of a niche scent (it doesn't smell like it has been through a focus group) and a mainstream offering (it is pretty, even charming, and perfectly accessible). Highly recommended, and I look forward with great interest to whatever LesNEZ comes up with next. The Unicorn Spell is an Eau de Parfum, and is around $70 for 50 ml at the LesNez website. I'm glad you found the similarities with AG La Violette too, Robin! Whenever I smell it it makes me think of that fragrance a lot, so I don't know whether it's really original.. but certainly a nice, appealing fragrance! I would still call it original…it does have nods to La Violette and Duel, but it isn't like if you owned either of those, you wouldn't want to own this — or at least, it isn't that way to me! a little random question, but can anyone please suggest a good travel atomizer that doesn't leak? I buy my atomizers and sample vials from pilotvials.com, and have never had a problem with leakage. Ooooh! My samples are on the way. I am so excited about these, my hopes are very high. Where the heck are my samples???? I can't wait to test these dern things. M, I really think you will like them. The “Let Me Play the Lion…” is in many ways a more interesting scent, but The Unicorn Spell is just so darn likeable. L'Antimatiere I would call a perfumer's perfume…very interesting, way cool and all that, but perhaps over my head — but have read at least one glowing review from someone who went ahead and bought a bottle, so it isn't over everyone's head apparently. Hope they will get there soon R, and hope some retailer in the US will pick these up (assuming that is even an option, I don't know what LesNEZ hopes to do). LOL, so true! M, what did you think of L'Antimatiere? Can't smell it, so have no thoughts on it. I mean, it smells of nothing on me. Scentless. Weird. But I do like The Lion a lot. It never ends, does it L? My samples arrived last week, and I like them all…. I find them to be very linear- they do not develop in any way. As they go on, so they stay. I will chalk them up to an interesting olfactory experience, and enjoy them solely from that perspective. Not at all, everyone has their own taste! I didn't have a problem with lasting power, although The Unicorn Spell in particular is a scent without much sillage and I probably put more on than I would usually do with an EdP. The Lion is a great scent, and I need to try it again — it might actually suit me more too, but The Unicorn Spell just bowled me over from the start.